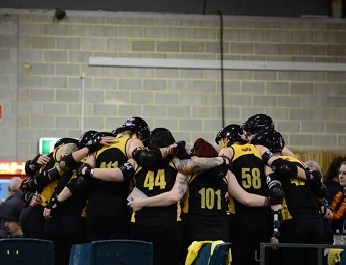 Canberra Roller Derby League is excited to present QUAD SAVE THE QUEEN, a colony-wide roller derby tournament on the Queen's Birthday June long weekend (6-8 June) held at the Southern Cross Basketball Stadium. 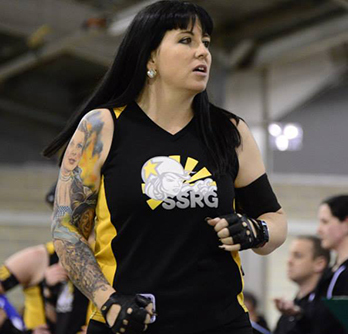 This is CRDL's third tournament in three years––and we're positive it will be the best yet! The epic event guarantees two tracks and three days of explosive roller derby from TWELVE teams all across Australia and New Zealand! QSTQ will also employ a knock-out structure rather than tiered, which will give every team an equal chance to the throne...we mean, trophy. Of the 21 full games, at least 6 will be WFTDA-sanctioned (and there will also be another 12 x 40-minutes games). Additionally, official WFTDA evaluations and testing will be carried out during the tournament. As the first event that CRDL has hosted with a strong WFTDA focus, we are very excited to bring together a range of WFTDA and non-WFTDA leagues from across Australia and New Zealand. This is a great opportunity to support the growth of the WFTDA community in our corner of Australasia! 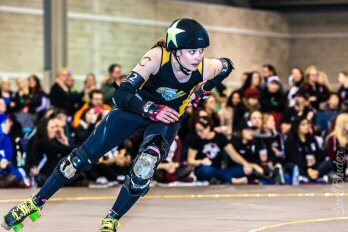 This tournament will be a great introduction to the Australian derby community for CRDL's newest derbutantes. Not only will they be able to spectate and participate alongside their derby brethren in the running of such an event, they will also be undergoing a CRDL rite of passage by participating in the Carnival of Carnage! 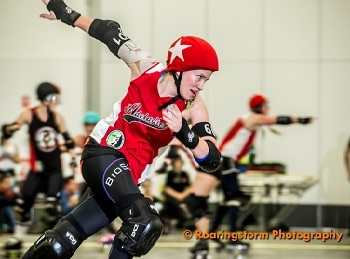 Affectionately known as CoC, the Carnival of Carnage is a round-robin tournament made up of teams from the newest intake group, bolstered by other CRDL fan favourites not otherwise skating. Abode Apartments is the exclusive accommodation partner for Quad Save the Queen and will be working with CRDL to provide the best value for our guests. Join our event on Facebook to learn more about the deals available! First up, without them, there is no ‘you’. So thank them. Also, thank them for driving you to training. And to competition. And paying for both. And giving up their weekends so you can compete. If you want to compete, even at the junior level, sport has become expensive. So it pays to have some sponsors that can help you. An athlete should have an ‘Athlete Portfolio’ – think of it as resume for your sporting achievements– that you can hand over to any potential sponsor at any time. It’s easy to only hang around those that compete in the same sport as you but it’s better if you have friends outside of that circle that have different interests to you. They will remind you that there is more to life than your sport. Remember how awesome it was when one of the older athletes chatted with you or helped you out? Well, it’s good idea to pass that on to an athlete that is younger than you. Take them under your wing, ask about their training or their performance or invite them to come train with you for a while. They’ll love it and you’ll learn from it. There will reach a time when it’ll be tough to participate in other sports and still improve in your main sport but keep participating in those sports as long as possible. There will reach a time when it’ll be tough to continue with school and still improve your main sport but keep in school as long as possible. You never know what might happen and you’ll never know when it’ll happen so keep all your doors open for as long as possible. I have a rule for all my Athletes: carry and clean your own equipment. This will help keep you respectful and humble. When was the last time you thanked your sponsors? How did you thank them? Did you pop in and thank them in person so that their customers could what a great job they’re doing? Did you write a hand-written letter and attach a picture so that they can proudly display at their work? However you choose to thank them, remember that if you go above and beyond, chances are they’ll go above and beyond. Even if your Coach gets paid, it is almost guaranteed that they do more than is expected of them. Send them a text, give them a call or write a note. Just say thanks (and know you have made someone very happy). There are two reasons for this. Firstly, a cluttered room often means a cluttered mind and great performances rely on laser sharp focus. Secondly, your parents will really appreciate it. They want to be proud of their home and a messy (smelly?) room does the opposite. So give it a tidy and keep it that (you know it doesn’t take that much effort!). She probably does more for you than you’ll ever know. She also feels your pain when you’re injured, your despair when you don’t get the result you worked and the disappointment when you don’t get selected when you thought you would. So, the next time you see her, go and give her a massive hug. The Australian Masters Games will be held in Adelaide, South Australia from the 3rd - 10th October 2015. 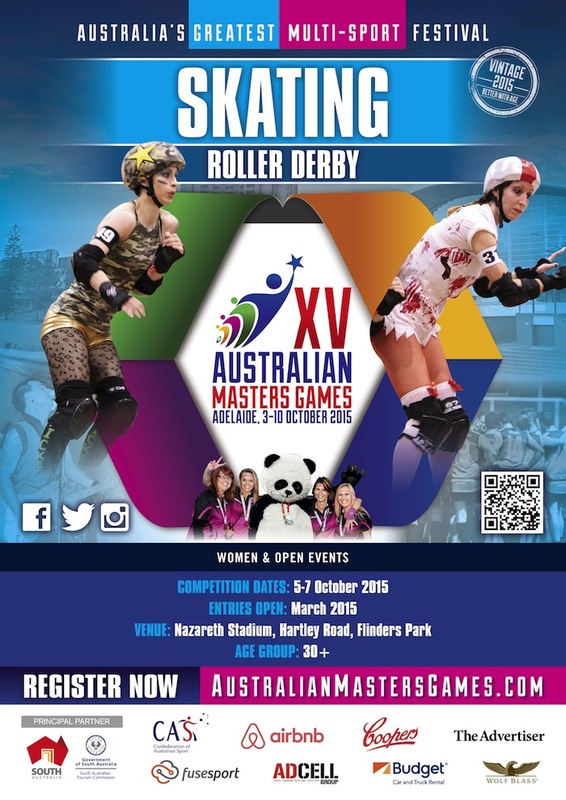 For the first time in the Australian Masters Games history, Roller Derby has been included in this years list of sports that will be showcased at the Games. Over 10,000 people from across Australia and overseas. The event is open to anyone who meets the age requirements of their sport of choice. It does not impose qualifying standards and welcomes participants from all over the world. The only criteria to compete in the Australian Masters Games is you must meet the minimum age criteria, which in most sports is 30 years. The Australian Masters Games isd a week-long festival of sport and festivities. Australia’s largest regular multisport Games will feature over 55+ sports, ranging from athletics tobasketball to cue sports to roller derby. • Teams, team members & supporters need to register as a paying participants. Register Here! Officials for RD will receive the same as participants plus meals during the RD event. Entertainment- As well as an extensive sporting schedule, the Australian Masters Games will also comprise a variety of social events throughout the week, providing a festival atmosphere for both competitors and visitors to Adelaide. When you say "Roller Derby" to the casual passer by, they still think girls in fishnets hitting each other on skates. Well we all know that derby has moved far beyond that, but the number of guys playing derby is still greatly outnumbered by women. However that is changing too, thanks in part to the men of the New York Shock Exchange. Pulled together in 2006 by Jonathan R, the NYSE played their first game way back in 2007. They went on to be a founding member of the Men’s Derby Coalition, and champions at the first year's tournament in 2010. The next year MDC became the MRDA, and once again, Shock Exchange took home the championship trophy. They share practice space with WFTDA champions the Gotham Girls Roller Derby, and you'll have seen NYSE's own Buster Cheatin and Abe Drinkin on the bench helping the Gotham All Stars to take home the Hydra trophy 4 years running. Down Under, mens derby has taken a little longer to get going. In the year that NYSE won their first championship trophy, the Aussie guys had only just done their foray onto the track with the 2010 Moustachio Nuts games. In 2012, NSW saw its first full length mens game with the Incredible Hulks vs the Dark Knights. That sparked the flame for men's derby for a lot of people - soon after, the Sydney Merby Crew incorporated and became Sydney City SMASH Mens Derby. A bit of a crazy thing happened next, the Aussie guys got together and formed a national team - The Wizards of Aus. June 2013 saw Australia's first dedicated men's bootcamp happen - the Nut Factory. Guys came together from all over the country and spent 2 days learning how to play derby using their own style. And in the evening we watched This Is How I Roll - the story of how the Shock Exchange and the MRDA came together. We hadn't event played any league games yet, but the guys were so keen coming out of the Nut Factory and from seeing what the guys from New York could do, that the Wizards took on New Zealand in Sydney in August 2013. Not wanting to rest, the Sydney SMASH Bros then played Australia's first interleague men's game in Port Macquarie later that month, and soon after took on BCR's Scartel on their home ground of Ipswich. 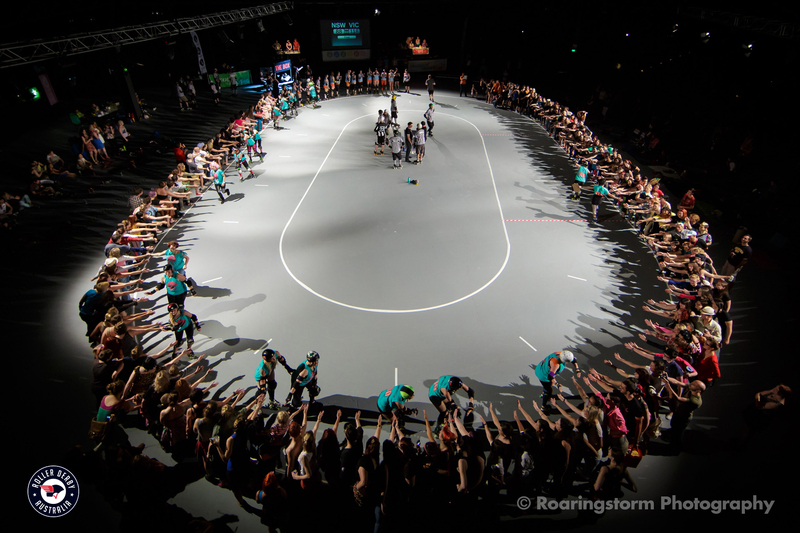 2014 saw an even greater challenge - the first Mens Roller Derby World Cup. Tryouts happened around the country, and a squad of 20 skaters were selected to travel to the UK to compete against the best in the world. Sydney City SMASH was the most represented league on Australian squad, and along with guys from Perth, Tassie, Brisbane, Adelaide and Melbourne, the Wizards spent a week training in Scotland before the tournament in Birmingham. The Wizards had a nailbiter game against Wales to take home 5th place in the world, and since then men's derby has been very much part of the Aussie community. 2014 finished off with the AMRD Nationals - where 9 league-teams from Australia and NZ came together in the summer heat of Ipswich for a 2-day tournament which saw the Victorian Vanguard defeat Sydney SMASH Bros and the Bass Straight Brawlers to be champions. Both the SMASH Bros and the Brawlers are ready to prove they are not second best, and have been working together with NYSE to bring another first to Australian derby - the first International mens inter-league games to be played on these shores. 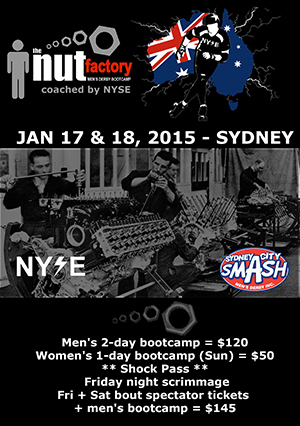 In Jan 2015 the Shock Down Under tour will bring the men from New York out, and after a stop at the Bont Invitational and a mid-week game in Brisbane, they are coming to Sydney for the 2015 NUT FACTORY bootcamp. Sydney, at the Menai Indoor Sports Centre, on Friday Jan 16 - Tasmania's Bass Straight Brawlers will take on the Shock Exchange in a full length game. and on Sat Jan 17, the Sydney SMASH Bros will test their skills against the men from New York. The SMASH and Brawlers games are just part of the event - and this is where you get involved. The NUT FACTORY will include a full length black & white mens game for attendees first up Friday night, then there will be a 2-day bootcamp coached by the NYSE, with Saturday dedicated to mens derby skaters. 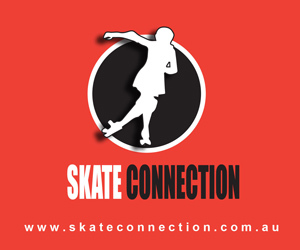 Sunday will be running 4 tracks plus an off-skates room, and will be open to all adult skaters, so guys and girls can learn together from these amazing skaters and coaches. Finishing off the weekend, will be a coed scrimmage with the NYSE guys playing on both teams, so you can test out these new skills and see just how they compare to some of the best in the world. Tickets are on-sale now, click here to head to the event page. Option for off-skates coaches to attend, or a SHOCK PASS that gets you into the Friday B&W game, spectators for both NYSE games + the whole bootcamp. How did you get into derby and how long have you been playing? My girlfriend dragged me along to learn to skate. I got hooked on the game and the people and here we are 4 years later. Highlight of your derby career? Winning the 2012 Men's European final by 2 points, winning the 5th place final at the men's World Cup by 1 point or being part of the All Stars at Playoffs last year - I've been spoilt rotten! What is your personal derby goal? Play some legendary games, meet more great people and keep enjoying every moment. Who is your Derby Idol? My lovely lady friend, Meg.A Tsunami, who got me into derby in the first place. She's a really tough jammer! What is the best piece of advice you could give and up and coming derby player? Regularly take time out from team training to play around with your own skills - enjoy teaching yourself new things! Watched it, loved it, did it! Retired after 5 years and now love supporting from the bench. Soooo many, but my last game was Captaining my team against Gotham, that's up there. I love helping develop players and teams. Watching the growth and those moments when it just clicks for players is something powerful. Cliche as it might sound but I have a new one every game I watch. Everyone who takes that track deserves that tag. There will be fears, tears and joy, embrace it all and continue to challenge yourself. Making it to WFTDA Champs with my team! I was also really excited to be selected for the Victorian Vagine Regime team last year - this was the first time I was selected for any team. I love VR and Battle on the Bent Track in Sydney 2013 was an amazing event. Earlier this year I competed as part of my university’s Cheerleading team. The uniform included a compulsory hair bow. I started skating 3 years go when a friend taught me to skate because I was injured and couldn't do the circus training I had been doing. I intended to never do contact because I was scared of getting hurt, but I accidentally fell in love with derby. What are your personal goals for your derby career? Best piece of derby advice you've received? Get some skates that fit you. 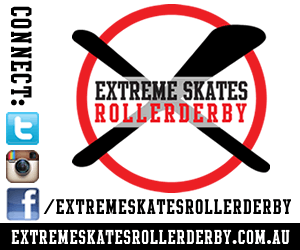 What would be the best piece of advice you could offer to an up and coming derby skater? Use SMART goals and write them down. When you can’t do something, try to find a way to break it down into bits that you can learn. Practice a lot, unless you’re injured. Just through the old grapevine. Since 2008 I think. But a lot of that time we didn't know what we were doing down here so it was just learning to skate etc. I remember watching footage of our first bout and jammers didn't actually call it off at any kind of appropriate time for example. We were just happy to be rolling around I think. Um so many I'm sure. Within a derby lifetime you say hello and goodbye to so many great people so hard to pick only one. It's just enjoying what we do I guess with great people and in particular when you pull off something great as a team that you think the only way to do so would be to have our brains wired. Things that stick in my mind was our first ever TGSS, World Cup 2011, and just training sessions or local games with your good mates that makes you warm inside. I guess just to be better. Try to set a good example for the sport also. Ah Bonnie Thunders, say no more. Na, because she is great, she plays hard, smart and clean. Mainly I think because she was my first ever idol and I guess I'm kind of loyal like that too. So she really was the first thing I saw to inspire me, if that's not too corny. But there is so much skill out there it's hard to name a few others, but I definitely admire many more. Mainly just think they are freaks. But they always seem so far away, like it's OK that they are that good because they are from far away. BUT then you look at all the talent Australia has and it kind of makes you feel like much more of an underachiever. So I guess I'll have to add a few from Team Australia on that list as well as a few people I admire from my own home league for their guts, that I don't have and ability to train the way they do, and how they love it. I guess we learn most from the ones closest to us in that way because we can see both the good and bad. What kind of person we want to be and don't. Just try, don't be afraid to stuff up. You won't ever let your team down if you keep trying. Don't wear fear, don't let other teams, outside factors mess with your focus and take away from your game. There will always be things you can't control so stop letting them mess with you. Just control you and your attitude toward things. Plus just enjoy every step that you are at along your journey, you never know for what reason and when it may come to an end. Don't take things to heart so much and try not to have any anger about stuff in you. Just doesn't work. 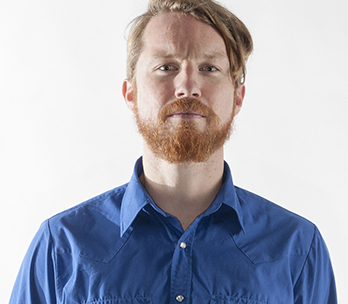 Featured Skater-Team Australia's Colonel Kaos! I have been playing for 4 years. I was a bit of a skate park punk and grew up on all sorts of wheeled fun things. Knowing this, my friends took me to a few bouts in 2010 and was totally hooked, I joined the ADRD fresh meat program that same year and haven't looked back! Making the 2014 Team Australia Squad! ^_^. To always challenge myself and be the best skater I can be. I would love to play in this years World Cup and hopefully one day make it to the WFTDA playoffs with my league. Skate as often as possible, ask lots of questions, push yourself! Train just as hard on skates as you do off skates, fitness is your friend! My friend introduced me and I've been playing since 2009. Getting picked to play on the banked track the LA derby dolls. Perfect your basic derby skills before attempting to try the hard and technical skills. As an athlete, there is no doubt that you want to succeed. You put in the effort, spend countless hours training and improving, even more hours discussing, analysing and dreaming about your sport. 1) Go to Bed at the Same Time Every Night. Something that is clear when it comes to sleep and performance: you need plenty of quality sleep! There are many ways you can improve the quality of your sleep but one easy way is to go to bed and awake at the same time every night. Simple. 2) Stretch Daily. There are 1,440 minutes in the day and there is no way you can convince anyone that you couldn’t find 10 to stretch some of the major muscles you (ab)use daily. And you’ll feel so much better. 3) No More Fast Food. Not as a treat or snack or a reward. Cut it out. McDonalds, KFC, etc. have no place in an athlete’s diet. There are plenty of other tastier, healthier alternatives. 4) Attack Your Weaknesses. We all prefer to focus on our strengths – it is easier and definitely more comfortable. However, it might be that weakness that is holding you back. Add an extra set on your weaker leg, ask a sibling to help you out or stay after practice for some more individual work (your coach will only be too pleased to see your initiative!). Just 10 minutes, five times a week would give you over 20 hours of extra work a year! 5) Get Stronger. In over 15 years of working with athletes in a range of sports I have never heard a coach say ‘That athlete is too strong’. Neither has anyone I have ever talked to. Hit the gym or do some extra body weight exercises… You’ll see an improvement in your sport. 6) Train so hard your coach has to hold you back, not push you on. When was the last time you asked your coach for extra work? When was the last time you just went out and did a session by yourself? If you only do what your coach asks of you your success will be limited. If you have to be held back, there is no doubt you will succeed. MORE: Find out about our Junior Sport Science Symposium. 7) Turn off your phones, tablets, laptops & TV 30 minutes before you go to bed. We know sleep in vital to performance and these things are not good for your sleep. They stimulate your brain and make it hard to relax – not good if you need the recovery sleep provides. 8) Protein and 3 Colours at Every Meal. Eggs, asparagus (green), tomato (red) & banana (yellow). Salmon, capsicum, broccoli, & pumpkin (orange). Chicken, egg plant, zucchini, carrots. These are examples of what you major meals should look like. As a rule of thumb each colour represents a group of nutrients, so by having multiple colours during the day your body is getting a wide range of nutrients. 9) Recover Better. There are many sporting programs where the ‘recovery’ is scheduled into the annual plans but it doesn’t mean you can’t do extra. Jump on the foam roller, re-read point (2), book a massage yourself, splash around in a pool (especially if the water is cold), go for a body surf, take a friend to watch a movie, read a book. Good luck and enjoy the rest of your journey. PS You may have noticed that you can control every one of the above points (and most don’t cost a thing!). I've been playing since 2008 after my sister told me I should come and join this roller skating thing she did. I love to make smaller goals - as in month to month type goals. Sharing these goals with someone also helps keep you on point. I have always admired Smarty Pants. She is an amazing woman and I find her coaching style extremely engaging. I've also been lucky enough to be able to play alongside her with Team Antik and I always learn something new each and every time I see her. To always keep learning. Go to as many clinics you can afford and get the most out of every session. Different coaches have such a diverse range of skills and coaching attributes that you will be able to benefit from. Thank you to K M Photography for this amazing shot of Cookie at the 2014 Tropicarnage Cup! Although it will soon become very clear, I should preface this by saying that it is not a “coming out” story - this is the story of how roller derby taught me to be friends with girls. I read somewhere a few years ago an off-hand remark by Bonnie D. Stroir about how most of us [derby players] were friends with more guys than girls in our pre-derby lives. I don’t remember the context, but I do remember being dubious of where she had found her data. Nevertheless, it piqued my curiosity learninh that my experience was a more common one than I realised. I wasn’t exactly a tomboy growing up (although you probably couldn’t say the same of me these days) but my entire childhood was spent surrounded by boys - I had two brothers, and the only cousins I regularly saw were dudes. As I got older, I continued to make friends with boys effortlessly, while kind of struggling to befriend girls. I didn’t get girls. They talked about stuff I didn’t identify with. They were quite vocal when they didn’t like what I wore or said or did. They were really intimidating, and they made me feel bad about myself. Girls were mean. Ms Norbury’s monologue at the end of Mean Girls resonated with me probably more than it should have. I felt like she was speaking to me; I knew first hand exactly what she was talking about. As author Chimamanda Ngozi Adichie said in her TEDx talk, girls are taught (whether explicitly, or by the way society shapes us) that we’re in competition with one another, usually for the attention of men (or high school boys, as the case may be). When I was younger, girls modified their behaviour and said things they thought boys wanted them say. They would cut each other down and go out of their way to cause trouble for one another, and I just wasn’t emotionally equipped to deal with that kind of thing. You didn’t get that when you were friends with boys - what you saw was what you got. I suppose this is an idea I’ve clung to throughout my life, and as such it just never occurred to me that it was unusual to have lots of Platonic male friends. Here are some fast facts about me: I am 100% pro-women. I am for gender equality. I’m planning on writing my PhD dissertation on female heroes in literature. I think that cats do, in fact, need feminism, for all of the reasons I’ve mentioned above. But five years ago, I could count on one hand the number of girls I was friends with. Then I started playing roller derby. I met academics with whom I nerded out about philosophy and literature. I met crafters with whom I crocheted and traded patterns. I met girls who didn’t censor themselves. I met girls so hilarious I struggled to breathe whenever we were together. I met girls who didn’t give a damn what anyone else thought. I met girls who stood up for themselves and for the rest of us. I met girls who wanted to see me succeed. 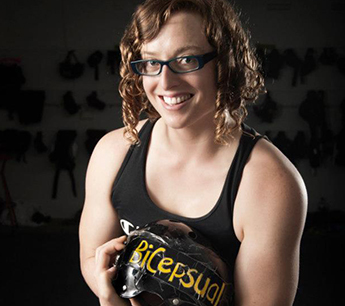 Roller derby was this social space I’d never experienced before - we were allowed to do what we wanted, say what we wanted, and dress how we wanted, without fear of retribution and without worrying about what girls should say or do. For the first time in my life, girls weren’t fighting one another; they weren’t trying to cut each other down. Instead, they held one anothers’ hands and built each other up. I understand that there are exceptions; roller derby certainly isn’t free of the Mean Girl behaviour we grew up with in high school - I’d be delusional if I said it was. But those behaviours are not by any means part of the dominant discourse in derby, and they’re certainly not tolerated or encouraged by the majority of us. I also understand that not everyone had the same experiences with girls or with boys when they were growing up, but it seems there were at least a good few of us. I think the issue was simply that I didn’t know where to look to find the girls I needed in my life. So, for the one thousandth time: thank you, roller derby, for making everything better. Thank you Richard Tompsett for the use of this photo. For whatever reason, the whole ‘reality TV’ seems to leave me cold, I have, however, seen enough to wonder about our ability to give those closest to us reliable feedback. Watching an early round of one of the talent shows (e.g. Idol, So you think you can dance, etc.) it’s amazing to see the absolute shocked expressions of some truly untalented individual receive their first dose of ‘reality’. It’s hard not to wonder how many of the contestants have managed to go through their lives thinking they were adequately skilled without someone pulling them up and giving them the a bout of the truth. Of course, receiving honest, open and direct feedback can be one of the most confronting experiences of our lives (ask those TV show contestants). It can also be a huge step in the right direction of being a better coach. As an interesting aside, coaches are quick to evaluate an athlete based on some physical tests, their performance in competition or by some other means. This is seen as an integral part of coaching – see where the athlete is, plan some interventions, implement them and re-evaluate at a later date. Yet we don’t like to shine the spotlight on ourselves, see what we need to improve and go about improving those inadequacies. Yip, this probably going to be the toughest Coach Challenge so far. And yip, you’re going to have to swallow your ego and your pride. Arguably, it might even be your most important Challenge too. To soften the blow (slightly), invite a coach who is from outside your immediate environment – another club? Another sport? Another age group? The further from your environment the coach is, the easier it might be to take the feedback onboard. Remember, the coach is evaluating your ‘coaching ability’ not your technical and tactical knowledge. Your ability to connect the new information you’re presenting to information you’ve already covered. The flow of the session – does each part of training build from the previous section? Your organisation – is all the equipment ready to go, in the correct place, or is there too much down time trying to sort it out during the session? How are you the tracking athlete’s improvement? Are your athletes aware of what they need to improve? Your talk to action ratio. These are just a few of the questions they might use (have a look at the previous challenges for more ideas). After the session it’s time for that feedback. And it’s not going to be easy – coaching is deeply personal. Be strong. No arguments. Just take it on the chin. And if it doesn’t make you feel uncomfortable or annoyed, your evaluator is probably being too nice and you’re going to have to repeat the process. Big thanks to PROPELPERFORM for this week's challenge! I got into derby after seeing a poster at my local rink and watching 'Whip It'. Rocking the WFTDA World Champs and World Cup. Again, more than one. Sorry! 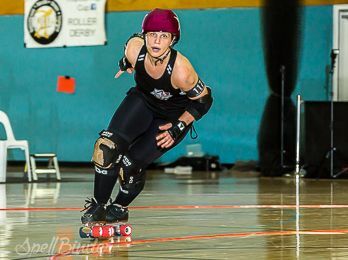 And (the skater formerly known as) Kitty DeCapitate from London - an ex team-mate and original home grown derby inspiration. An all-round awesome chick! 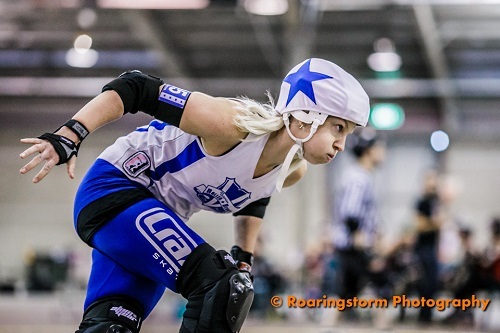 Thanks to Roaringstorm Photography for allowing us to use this super image of Mad Mel.